← ‘Zip Line’ to Wreck Beach for Construction of Early UBC Buildings? BC Hotel Association Convention. Photographer Unknown. Author’s Collection. I bought the snapshot shown above at a flea market a few months ago. It isn’t a great photo; it was taken at a rakish angle that is suggestive that the photographer had been sampling a bit too liberally from the beverages available at this gathering. But it appeals to me as a period photo. It seems candidly to stop the action for a second in a place and among a group in whom I was interested. So who were these folks? 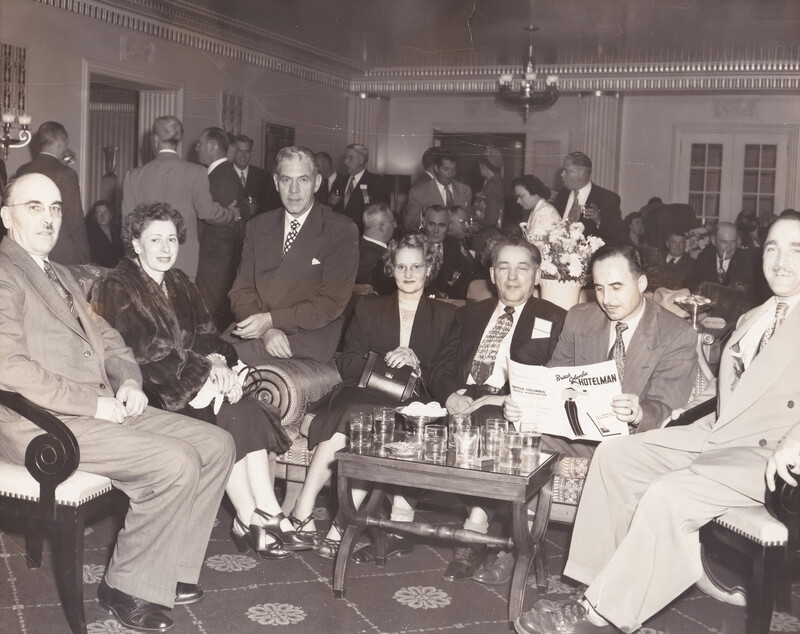 Judging from the document which was helpfully being leafed through by the seated chap on the right side of the image, it is a group of BC hoteliers at the 25th annual convention of their provincial organization, the BC Hotel Association (BCHA). Judging from the clothing worn, a couple of people who are better judges of such things than I guessed that this photo was probably made in the late 1940s or early ’50s. I have since confirmed that these dating approximations were spot-on. In fact, the image seems to have been taken in 1949. How can I be so sure of the year of this photo? With my magnifying glass, I was able to read from the cover of the BCHA periodical, BC Hotelman, that the issue was the one published for the ’25th Annual Convention’. I then made a trip to the Central branch of Vancouver Public Library to see if I could find this issue of BC Hotelman. Nope; it’s rarely that easy! The earliest issue in the collection was from 1968. I had a feeling from the guesses of my friends that the photo was from an earlier decade than the ’60s. So I then leafed through two or three issues of the Hotelman at VPL to see if I could find mention made of the BCHA convention planned for the current year — mention, preferably, that included reference to how many years the BCHA bad been meeting annually for their conventions. I found such a reference pretty quickly in the 1968 volume: it was an advertisement for the upcoming 44th annual meeting. It then became a simple math problem (even for me) to conclude that the 25th annual meeting was circa 1949. As to specifically who the gents and ladies are in the image, I have no clue. Most of the women in this photo, however, seem (to my eye) to have been present principally as the ‘wives of’ the BC hotelmen at the convention. This was 1949, after all. We were still a couple of decades short of women coming into their own as major players in businesses of this sort in significant numbers. Needless to say, the BCHA’s current serial is no longer called BC Hotelman! Where were they having their meeting that year? Well, plainly it was in a hotel somewhere in BC. But which location? The interior looked familiar to me. My guess was that it was the current Hotel Vancouver (1939-present). This is really the only local hotel with which I have any interior knowledge, but until yesterday I had nothing with which to substantiate that guess. Once again, I bow to that most useful of devices, my magnifying glass! On the tumblers scattered about on the coffee table in the foreground is printed, very helpfully, “Hotel Vancouver”! This entry was posted in hotels/motels/inns, Uncategorized and tagged bc, BC Hotelman, BCHA, British Columbia Hotel Association, history, Hotel Vancouver, vancouver. Bookmark the permalink. Good thing you have your magnifying glass! I use it a lot too. I love the fur coat the woman on the left is wearing. I’d love to have a real fur coat. Hi – I’m glad you’re still out there and reading VanAsItWas from time to time! Hope you’re doing well!